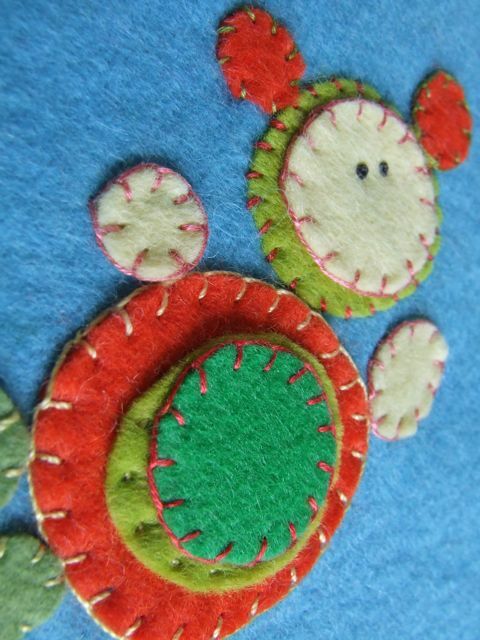 Today's gorgeous felt project is from the talented Michele of Michele Made Me. 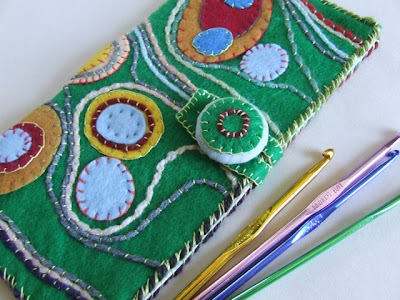 She's fairly new to blogging, but has a real flair for turning ordinary materials into breathtaking crafts (you've got to check out her pincushion made from a toilet paper roll - it looks ultra stylish!). Shall we get to the shoe-filling then?... Wish me luck! 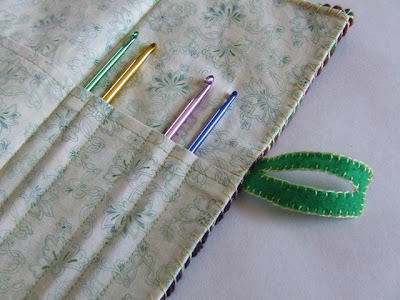 Today I am showing you how to make a 'Needle and Hook Book' to hold all of those sewing needles and crochet hooks. It is a colourful little project made of felt (cause it's Felt Week here at CraftShare, right?). So, here's what you will need: yarn, felt in many colours, embroidery floss, fabric, scissors, a couple of sewing needles. All that, plus your trusty sewing machine. Now, my design process is kinda simple. 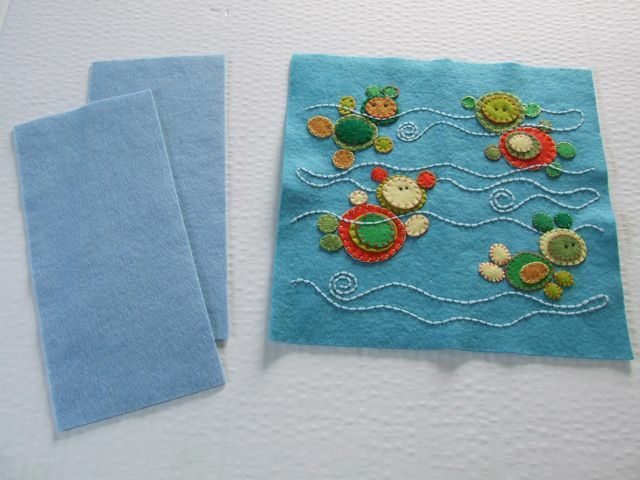 I just take out several felt colours that I feel go well together and start working! From these colours, I choose a main colour. Here, I chose blue. 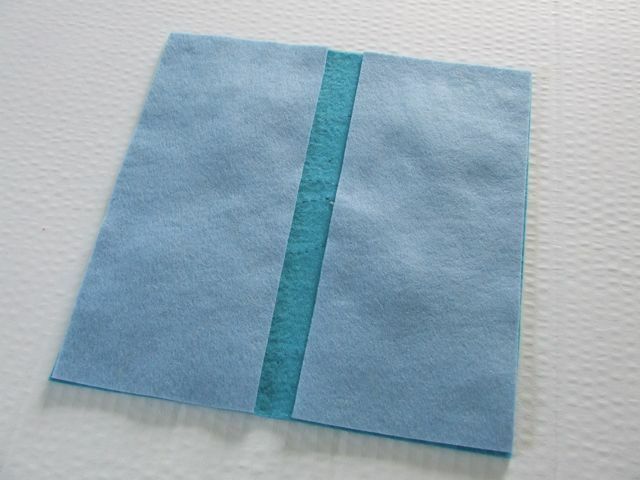 From this blue I cut out a 10"x 10" square. That's my background. 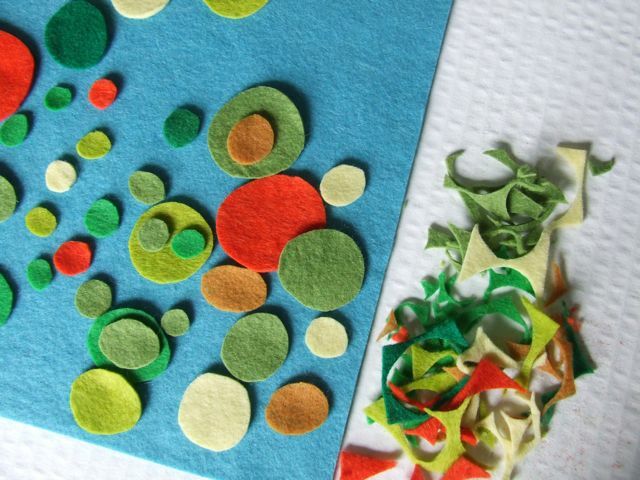 From my other coloured scraps, I very uncarefully (no templates here) cut out a bunch of differently sized circular shapes. I cut out a BUNCH. If I have too many I save them for a later project. I start to place my circles in some appealing way on my blue background, layering some of the circles, grouping them in complementary ways. Until I create a design that pleases me. In other words, I GO with it... I BECOME the felt, so to speak. 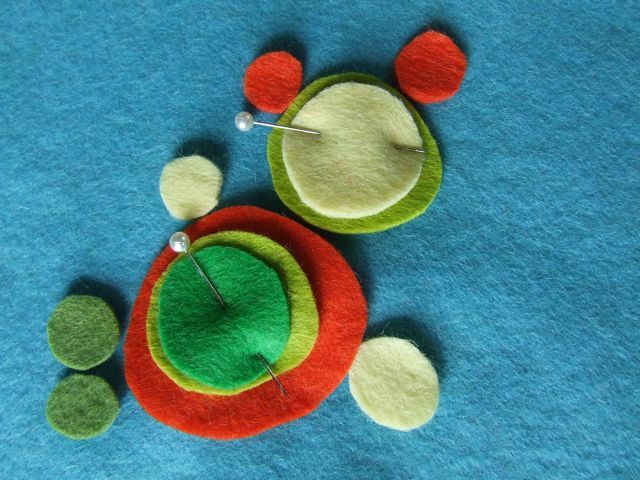 Once I have a design that I like, I pin a section of it to the background. 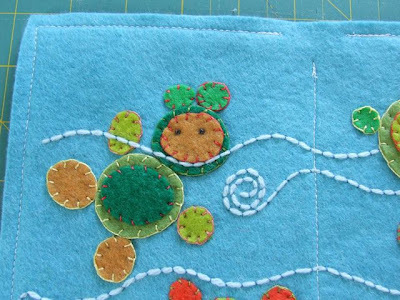 The rest of the felt design, I remove from the background and carefully set aside somewhere safe so it doesn't get all messed up. Don't want to have to start re-designing all over again! Working on this one section from the bottom layer up, I start embroidering the edges of my pieces with embroidery floss (your colour choice). 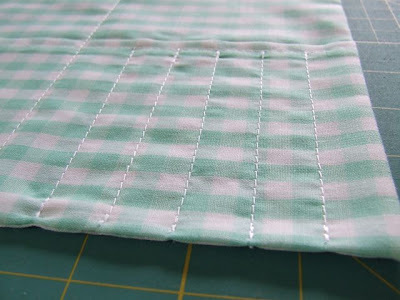 Here I use the most basic blanket stitch for every edge. For each eye, I use a french knot. 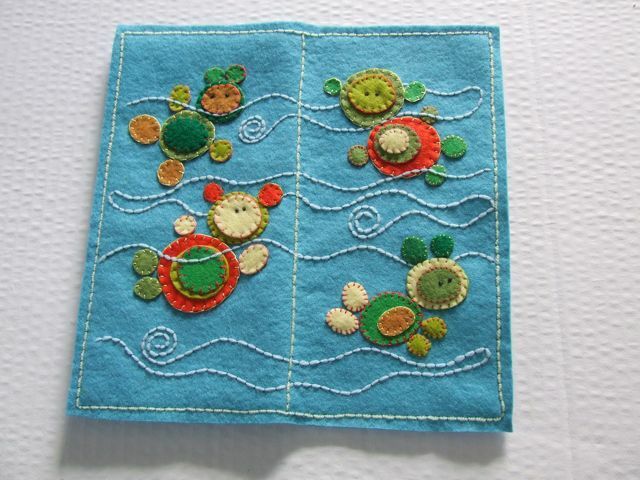 I repeat this step for each section of the design, until the whole thing is embroidered onto the background. Now I can embellish the whole piece with some couching. 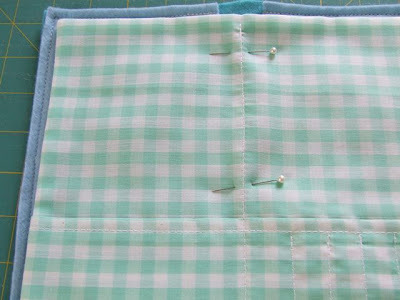 In this case the couching is done using yarn, and thread (to hold the yarn in place). You'll need a large sewing needle for the yarn and a smaller one for the thread. 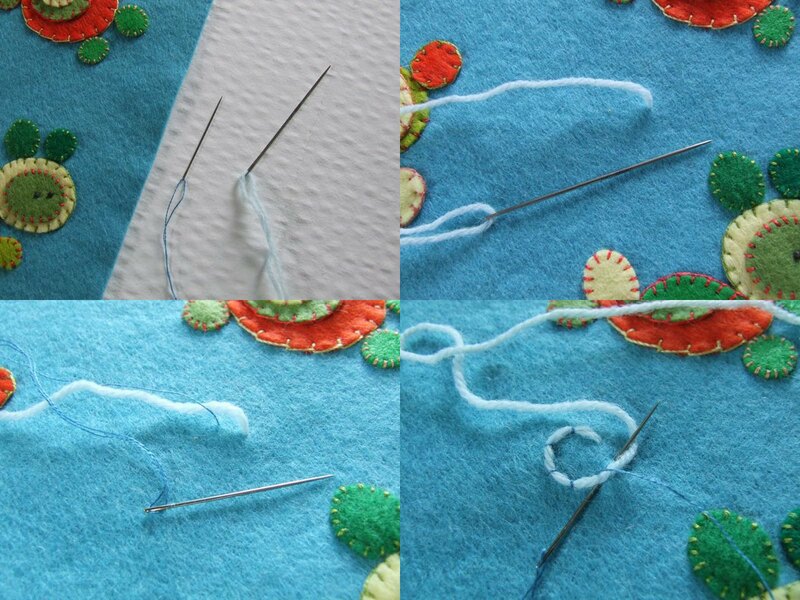 I start the couching by making a knot in the end of my yarn and bringing the yarn up through the background as shown. 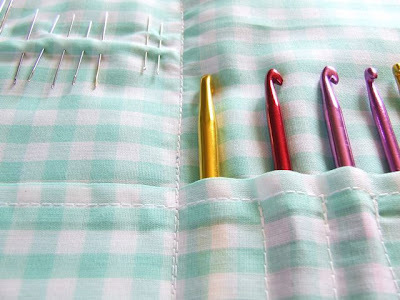 I do the same with the needle and thread. The couching process is also very free-form. 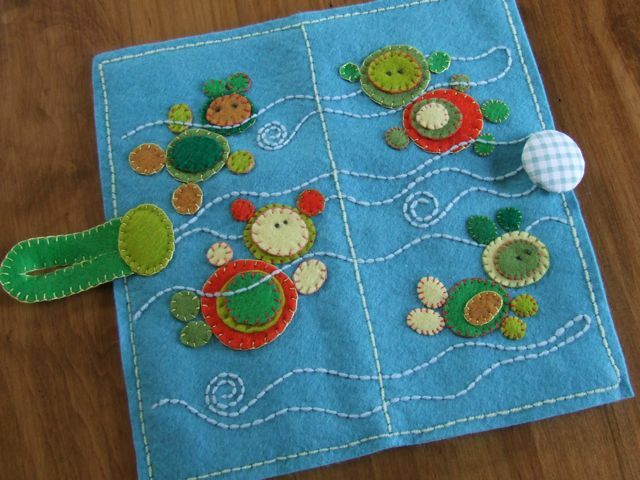 I design as I go, placing the yarn where I think it looks good and then sewing it in place with the thread. I do as much or as little as I like. The design dictates how much couching is needed. 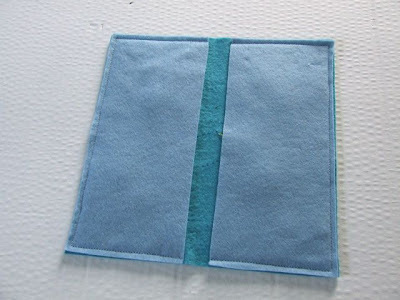 Once the couching is done, I cut out two rectangles of felt 4-1/2" wide x 10" high. I place them on the reverse side of my background. I machine-sew them in place with a 1/4" seam allowance. 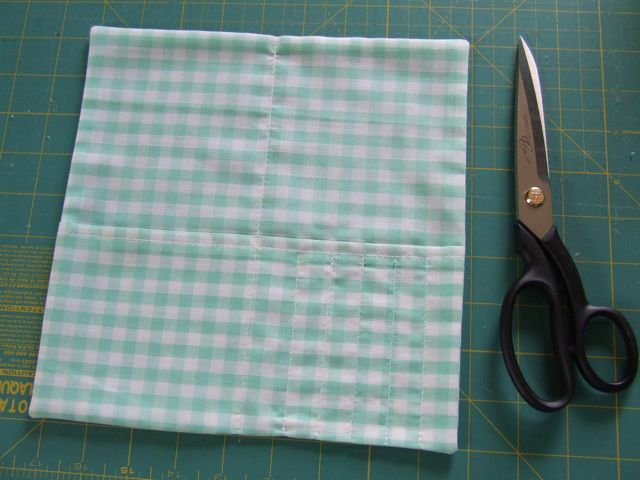 Next, I cut two rectangles out of a matching fabric. One rectangle measures 9-1/2" x 19"; the other measures 9-1/2" x 5". Here I fold the larger rectangle in half right sides together, making a square. 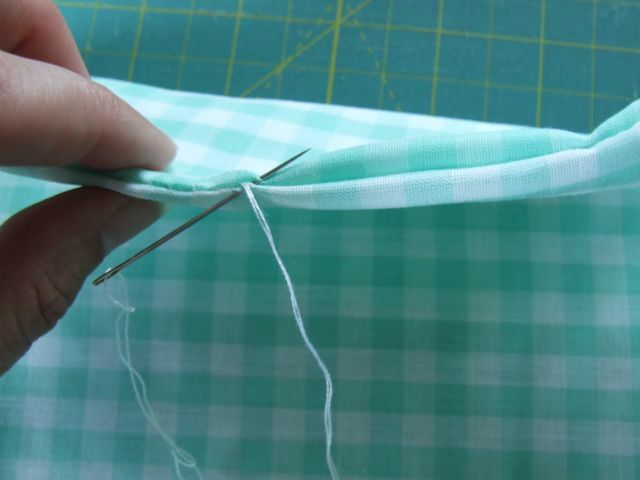 As in the following pic, I machine sew a hem in the top of my small rectangle. 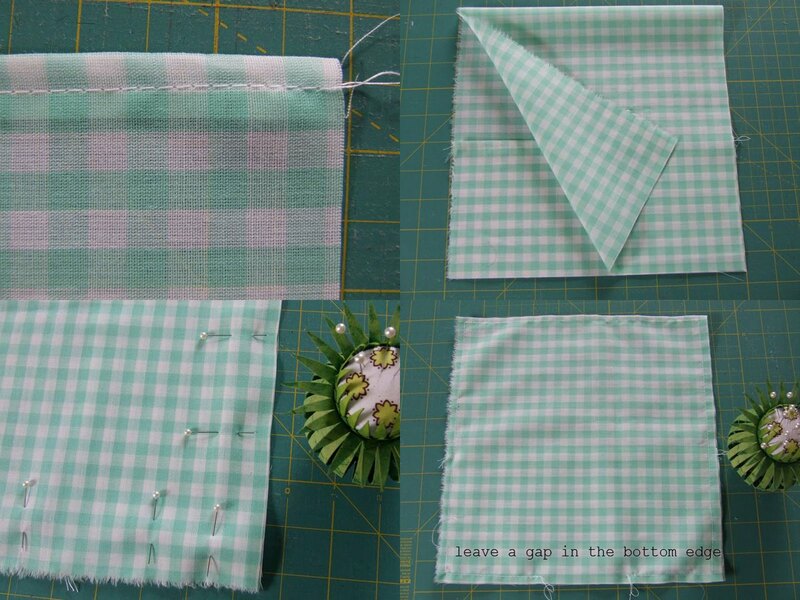 I place the small rectangle between the two layers of the square. 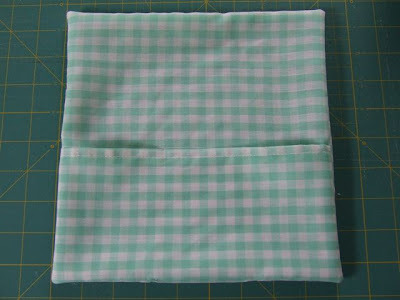 Then I pin the edges of the square and machine-sew (1/4" seam allowance) all around the edges leaving a 3" gap in the bottom edge. I flip the whole thing inside out and press. Now it looks like this. 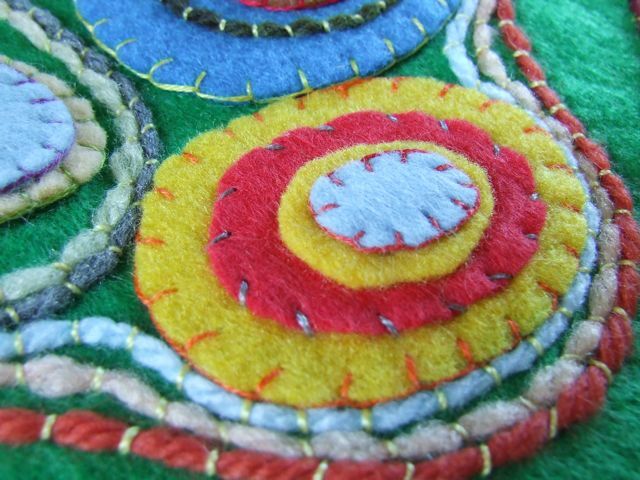 I close up the hole in the bottom with some hand stitching. And machine-stitch down the centre of the square. I also make some smaller channels by stitching a few lines in one of the pockets as shown. Now I pin the fabric square onto the felt square, back sides together. 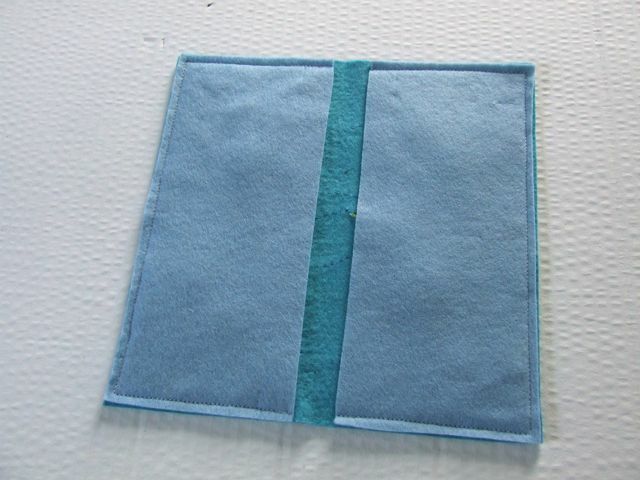 And I machine stitch down the centre to attach the fabric square to the felt square. It looks like this from the other side. Do I like the look of all that machine stitching on the front? Naw, it looks bad! 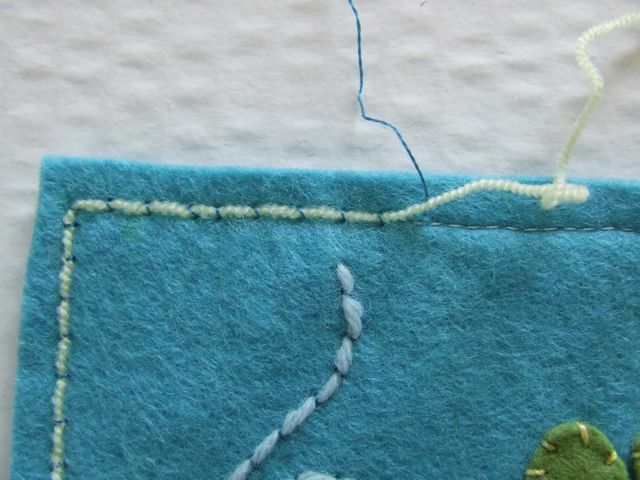 So I couch on top of the machine stitching all around the edges and down the centre line. To make it look like this... Much better! Look at those little teddies swimming around! They are having so much fun! Now, we're almost done, but not quite! 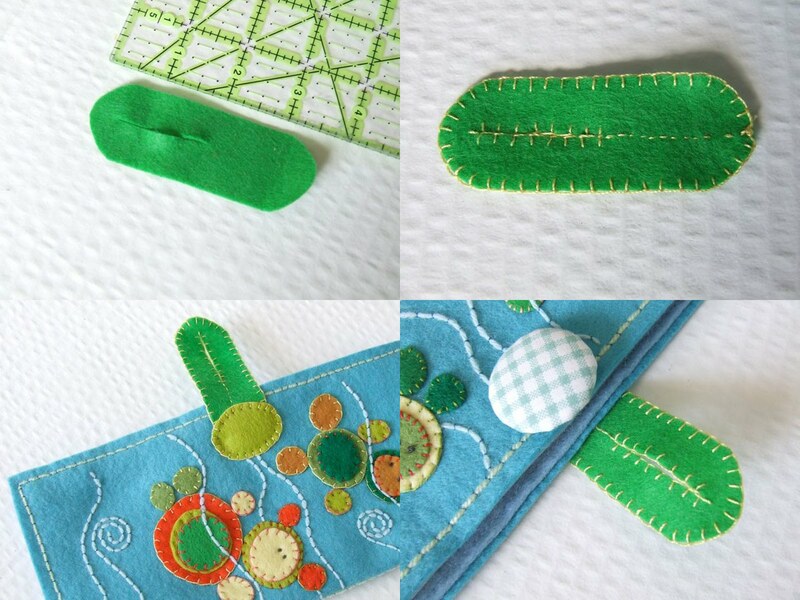 Finally, I make a fastener using a small piece of felt which has a 1-1/2 " slit in one side and is reinforced with blanket stitching. 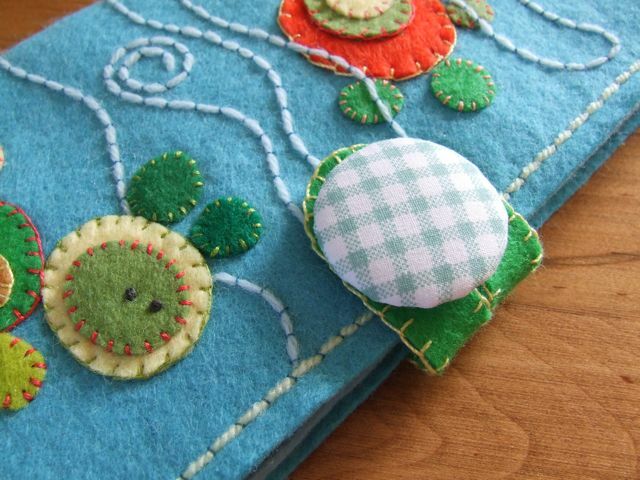 This piece is stitched to the back of the book and embellished with a circle. 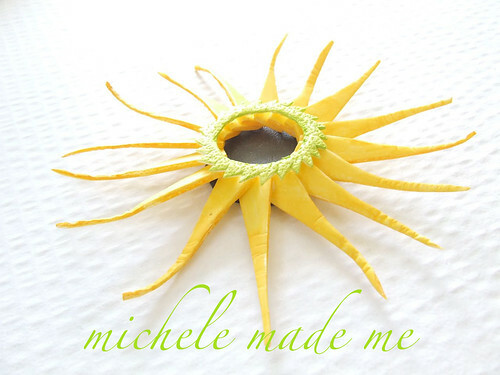 And a special "made-from-scratch Michele-Made-Me" covered button is used to finish the whole thing off!!! And here is another one I made for a friend using pretty much the same process. Thanks so much Michele for this fabulous & useful tutorial!! Oh My Goodness! This is really amazing. I love it! I can't wait to try it. Thanks for the wonderful tutorial. 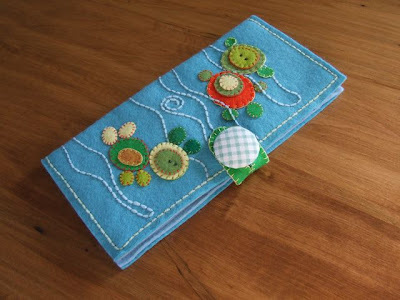 Lovely tutorial and great to discover your blog as well! oh my...that is soooo cute! 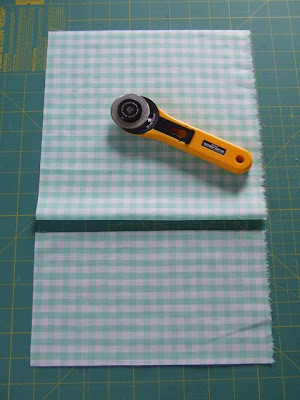 thanks cheryl for doing this whole Craftshare thing. 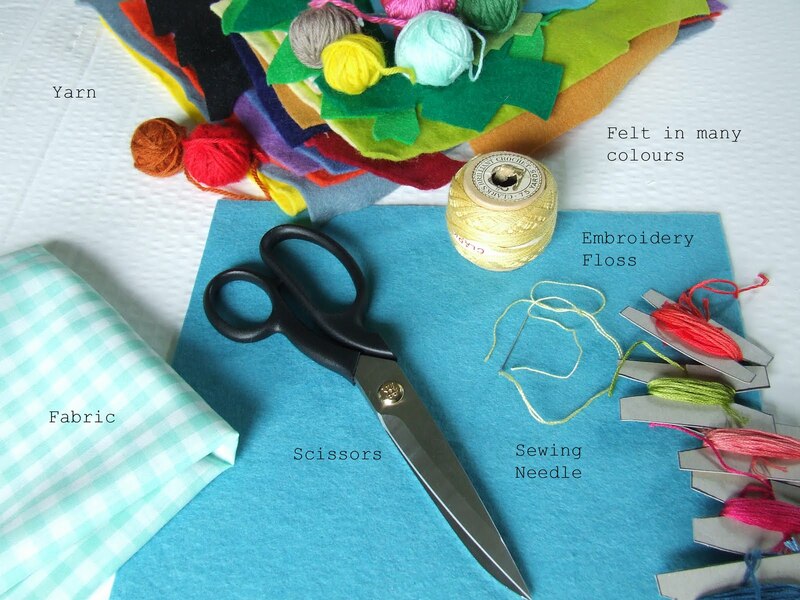 it's a great way for all of us to share some crafty ideas! Sew cute, I love those that have talent in felt! Beautifl! so cool. 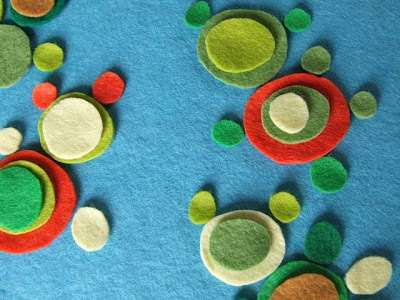 Now I want to go buy some felt. 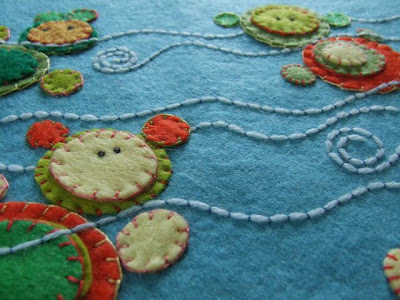 about yarn couching - loved that added touch. Thanks Cheryl for organizing all this fun info - it is nice to see what other talented people are up to! WOW SO pretty! You did a good job! This is a lot of work! WOW you are super crafty! Following you back, great blog! love love love! 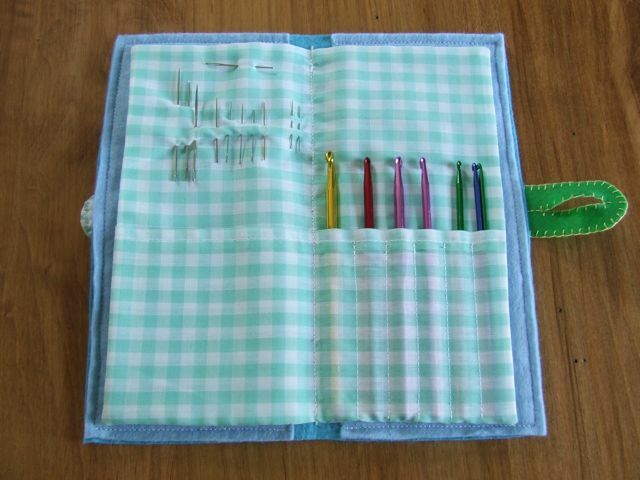 I don't have needles and hooks, but I've got other things this would be great for! I love this tutorial! It's so creative and useful!! I'm going to have to try it! That's so pretty! The embellishments are my favorite. Thanks so much to both of you, I'll be linking. I just dropped in by chance and it was my chance. What a lovely little thing to make of felt. Thank you so much to share it. 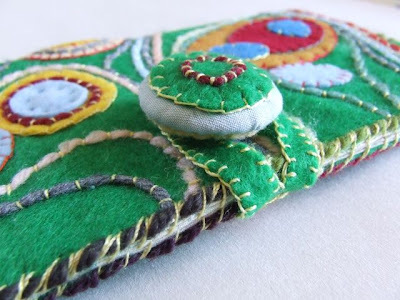 curious--what is the purpose of the second layer of felt on the inside? does it just act as a stablilizer? Yes, the two rectangles inside help hold the shape. You could also use medium/heavyweight stabilizer for that part too. This is amazing! I had a blind friend just ask me to make her something to organize her eyeliner, and I love the idea of this pattern. I've never worked with felt before, so it should be an adventure! Thank you for sharing! It's absolutely lovely.